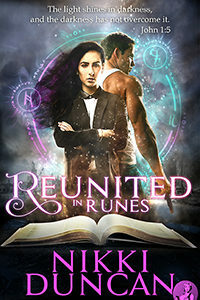 Former lovers, and tomb-raiding partners, team up to find an artifact believed to grant its possessors the power of immortality. Trapped, by need and desperation and inescapable yearning, Eden Maverick fought the sea of emotional blindness. The Bistro, her favorite Miami restaurant, was normally a haven. Potted palms provided shade. Fragrant flora edged the sidewalk. Couples and students from the nearby university sat at patio tables. The familiarity failed to settle her. Today, for the first time in two years, she expected to see Andrew. She’d prayed every day for two years of learning Andrew was alive. She’d dreamed of him every night. Now, with the hope of answers near, she grew nervous. Job has nothing on you. Meet me at nine. Our spot. Eden again read the note that had been left on her desk during her birthday party the night before. Andrew had often compared her to Job and he’d always called The Bistro their spot. Neither comment was a secret, but she hadn’t heard those words since he vanished. Anticipation squeezed her stomach and stretched across her ribs. The sensation began the moment she’d found the note. It had grown every time she replayed it. An itch started between her shoulder blades as she reached for the door handle. She breathed low and slow. The itch grew. Her grip slipped off the handle of the ornate, glass door. So much for control. Taking a tighter hold, she opened the door and stepped into the light and airy restaurant. The comforting aroma of fresh baked bread blended with the savory scent of sinful desserts. It wasn’t comforting. The atmosphere, in fact, was less soothing than ever. She teetered on the brink of finding hope or reliving her worst miseries. “Eden! Good morning.” With boyish glee bouncing in his voice, the head waiter lumbered through the tables. Sawyer was an awkward kind of sweet. He was working his way through college and she couldn’t help like him. He normally cheered her up, but she wasn’t in the mood to be cheered. His reminder of her habitual solitude aroused her barely suppressed nerves. She sat, forcing herself not to fidget. There was a chance she was walking into a trap. It wouldn’t be the first time she was targeted, but no one knew what she’d been working on. Most people who knew her just assumed she was obsessed with finding Andrew, which suited her. “I’ve heard change is good.” She sounded braver that she felt in the eye of an emotional hurricane. He glanced around the patio and then back to her. His shoulders were back instead of slightly rolled forward. He was on edge. Sawyer was never edgy. “I’ll get your order.” Sliding along their underbelly was an unspoken seriousness she’d never seen in Sawyer. Her heart kicked and the itch between her shoulder blades spread. She’d wondered if the message from Andrew, or who she hoped would be Andrew, was a trap. Sawyer’s awareness increased her suspicion. After Andrew’s disappearance she’d taken to living in the shadows, searching for him. She wouldn’t stop until she knew what had happened. Moving on was impossible. Eden clenched her jaw to keep from rotating it. Lacing her fingers in her lap stopped her from reaching up to rub feeling into her cheeks. Fidgets showed weakness when what she needed most at the moment was strength. Her mind drifted again to Andrew, not that it ever strayed far from him. A heartbeat later the memory of their first meeting returned. She’d been in Rome, heading into a bar for a celebratory drink after finding several Biblical coins of Antigonus. Andrew dropped into the middle of her world. Literally. Raised voices in the bar’s balcony grabbed her attention seconds before Andrew fell over the rail and landed at her feet. His gray eyes met and held hers as he rose to his feet. Her heart rate sped and her neck grew warm beneath the power of his gaze. Then he’d grinned, LED bright, and she’d barely held back a sigh at the sight. “Sure.” By the time she’d finished her glass of wine she’d teetered on the edge of love. An expert in U.S. History with a reputation for acquiring historical artifacts for museums and private collectors, she’d felt an instant kinship. She wasn’t sure if his looks, his charm or his profession had won her heart, but she’d quickly grown to adore him. He’d relocated to Florida to be with her. They’d worked together, faced fellow treasure hunters together and had barely parted for longer than a week or two. Until his disappearance. He nodded before moving to another table of patrons. He’d relaxed, though not quite to his normal lumbering ease. She studied the other patrons. Most were college students with their laptops open and ear buds in. There were a few business people. Only one man stood out with his tattoos and watchful eyes. He wasn’t a regular, or the kind of person she’d expect to see. He gave off a vibe she could only call anticipation. Like he was waiting for something. Someone? She’d beaten several hunters to relics over the years, and while it wasn’t uncommon for them to attempt retaliation, they were more obvious in their methods. More often than not they’d break into her hotel rooms or her car or they’d try to hurt her. She’d been doing some research, but she’d bumped up against Andrew’s expertise. Going farther without felt wrong, so she’d stopped. Whatever she was stepping into, it was bigger than a rival hunter. Checking her watch, Eden again stopped herself from fidgeting or reaching for the itchy spot between her shoulders. She had ten minutes. Ten minutes before Andrew was scheduled to show. Ten minutes to sit and pretend nothing was out of the ordinary. Ten minutes to agonize over the possibilities of what may have been if he hadn’t vanished. Ten minutes to fantasize about what may happen if he was back. Digging her nails into her thighs until the skin stung and her slamming pulse steadied, Eden resisted the urge to jump up and pace the fenced in patio. Her jacket grew too warm despite the light breeze. She craved answers. Until she discovered them, she wouldn’t relax or reveal the blasts of nerves exploding just beneath her skin. Sweat broke out on her palms. Her livelihood relied on uncovering the truth behind possibilities. She couldn’t stop looking when it mattered most. The chaotic thoughts flitting around in her head were migraine-inducing in strength and equally impossible to dodge. Ignoring the throbbing in her temple, she lifted a piece of bread and smeared it with hummus. With luck, the smooth spread would settle her stomach. All but a few friends encouraged her to move on. The ones who did not were in their own committed relationships. The ones who did thought she was crazy to believe he wasn’t dead. Even her FBI friends who kept a file open on Andrew’s disappearance, worried about her insistence that he was alive. They worried that she’d never open herself up again to happiness. She’d considered the same, but moving on meant breaking the bond she and Andrew shared. That bond told her he was alive. What she may have to face was the fact he’d chosen to stay gone. The lack of clues to his whereabouts forced her to consider a narrow range of possibilities: Andrew didn’t want to be found. Or someone didn’t want him found. As they always did, the ideas sank her spirits. She sat the bread down and checked her watch again. Five minutes left to wait and wonder. It grew increasingly difficult to believe there was a good reason. Andrew hadn’t been, wasn’t, the kind of man to walk away and leave her floundering in doubt. His promises were as solid as the ground beneath her feet, as dependable as her beating heart, as meaningful as the histories they both loved. He’d kissed her and promised to be seeing her; the message had to be from him. The air shifted. The breeze chilled eerily and then instantly warmed. The itch between her shoulder blades eased and her anxiety slid away beneath pure excitement. It was the same excitement she’d felt the night they met. Pivoting in her chair, with her head buzzing so loudly she heard nothing, she scanned the area beyond the patio. Cars passed and stopped at the nearby intersection. She rubbed her fluttering belly. Her body quaked, seeking completion that would only come with nearness to Andrew. She’d reacted the same way every time he came home after a trip without her or smiled at her from across a room or touched her. Warmth seeped deeper than the sun penetrated. She scanned the area again. Where are you? Another tremor rattled her foundations as something unspoken directed her gaze to the street. She reached into her pocket and pulled out some cash. Dropping it on the table, she walked toward the edge of the patio. The sun, filtered by wispy clouds, temporarily blinded her. An Audi R8 rolled to a stop at the curb. It was the car Andrew had lusted after, but never bought, saying they traveled more than he would be home to enjoy it. A broad-shouldered silhouette sat behind the dark tinted windows. Eden bit her bottom lip to suppress a cry of elation and with her forehead tilted forward in an attempt to see him she walked to the open gate in the patio’s fence. Her scalp tingled until every follicle felt as if it was dancing. He was alive and claiming his dreams. Did his message and this meeting mean she was still a part of those dreams? Could they find their way back to each other? She’d changed. There was no reason to assume he wouldn’t have or that they’d be able to recover what they’d once had. Would he even want her when he heard everything he’d missed? Her body temperature dropped fast and drastically, making her glad for the jacket. Eden hustled toward the silver metallic colored car. The paint color reminded her of the morning dew that sometimes covered the lawn at the timeshare beach cottage they’d spent a few weekends at. Each step closer, her heart expanded and lightened. Her wait for revelations was ending. She didn’t need to see in the car to know it was Andrew. She felt him. Not knowing what she was walking into or where he’d been, she should be more cautious. Emotionally. Physically. Caution ranked lower than logic when it came to Andrew and answers. “Eden.” Sawyer called out from where he stood close to the building. “See you later.” She called as she reached for the car’s door handle. Without giving more of a response or waiting for him to finish his statement, she opened the door and slid into the jet grey, leather seat. It cocooned her as securely as the warmth of Andrew’s nearness. He pulled away before she had the door fully closed.